There is a web page subset that has come to be called a "microsite" which is a cluster of 1-7 pages (or more) which supplements a main web site. These pages are used to add specialty information or details about other items on the main site, but which may be too complex for the main site's general visitor. Sometimes they are simply temporary sections of a web site, as when a company may be sponsoring a seminar or show, have a special offer or a limited-time program. Sometimes they may describe scientific principles for the more technically-oriented visitor. 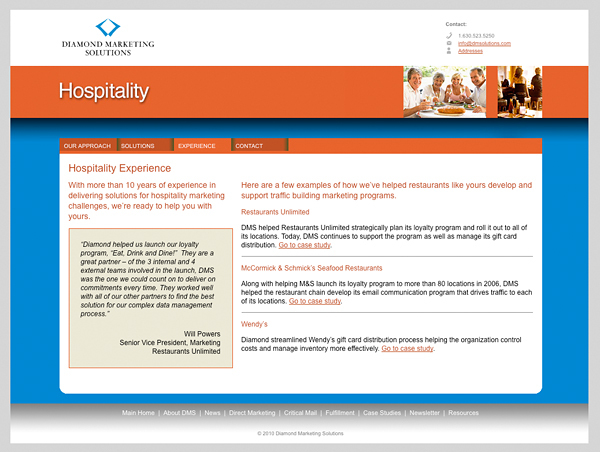 The microsites are basic clusters of support pages which often differ somewhat in the look and feel of the main site. There are lots of ways you might choose to use a microsite to focus beyond the scope of your main site. I love working on these types of projects. Contact me. One of my clients, Diamond Marketing Solutions (DMS) in Chicago had me create several "microsites" to augment their main web site (which I also designed and built). These microsites contain details and case studies within the specific vertical markets in which DMS has expertise.